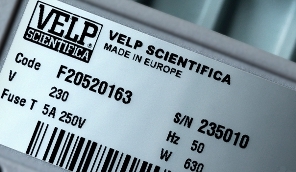 The worldwide success obtained by VELP is the result of a growing commitment backed by consistent investments aimed at increasing the company’s intellectual patrimony, internal R&D activities and collaboration with the scientific community. VELP has constantly introduced innovative and reliable products to the market. From the initial idea to the final product and throughout the test-runs carried out in our own laboratories, each VELP creation is followed with enthusiasm and team spirit. Parallel to the research activities, large investments are also dedicated to increasing productivity and improving the logistics and the organisational efficiency of the company through the introduction of advanced technology. The result is specifically developed technology and instruments; unique solutions for the most varied requirements. In perfect keeping with Company strategy, VELP has chosen to implement the operating platform SAP a fundamental tool for the total integration of the entire logistics chain. We at VELP are convinced that performance and efficiency can always be improved and this enables us to look to the future with the knowledge that we can offer our Customers increasingly better Solutions and Services. It is with this philosophy that we count on continuing the constant growth that has characterized VELP’s development and with which we prepare to face the challenge of an increasingly competitive future.